Imagine you turn 50, you live right next to the Lake of Constance and you have never seen the inside of a Zeppelin. This flaw applies to many people living in the Lake of Constance region. 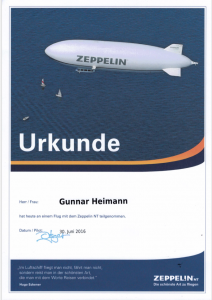 To right this wrong, the Heimann Engineering team have decided to sponsor our boss’s very first flight in a zeppelin – not only to enjoy the lake’s views from afar, but also to take a close up look at Graf Zeppelin’s work of engineering. 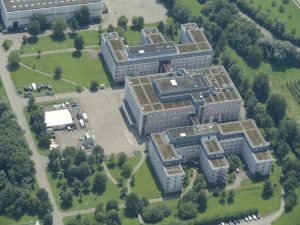 So on the 30th of June Mr Heimann took off to cruise around the Lake of Constance from above. From there he could not only admire the grandeur of the lake, but was also able to see his hometown. Not only the flight itself, but all of its curiosities will stay in my memory. Just before we took off, the electricity turned off and with it, the light did, too. It all became quite a steeplechase as we had to start with the security instructions on ground, because the electric door to get to the landing spot also remained shut. Once we finally made it to the zeppelin, we couldn’t just infiltrate the vessel as we were used to during our usual holiday season, but had to wait our turn. For every one person getting off the zeppelin, another passenger could enter it. This went on until all of the passengers were onboard the zeppelin, without it taking off too early. The distribution of seats allowed for every passenger to get a window seat – with the best chances of having the perfect view. To my surprise, the windows could be opened which was an incredible opportunity to take photographs, but wasn’t such a great thing if you considered that you could have lost your hat, your classes or even your camera while getting lost enjoying the breath taking views. Another peculiarity was how prone the zeppelin was to the wind. At one point the whole object moved along its own axis and in the opposed direction of the wind. I felt as though I was a duckling and always had to follow my mother (the pilot, in this case). Usually this isn’t part of your everyday zeppelin trip. Generally the zeppelin will only rise when there is no wind around, so we should enjoy it, said the stewardess. After an impressive flight and overwhelming flights we safely landed again in Friedrichshafen, having taken lots of impressions with us. I’d again like to express my thanks to my team for making this unforgettable experience happen.